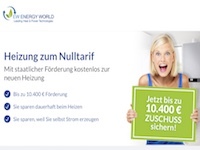 With EW Energy World for new heating! Our all-inclusive package includes everything you need to modernize your heating: Free for new heating state funding! Heating modernize professional. received up to 10,400 EUR promotion! The valid Lead will be reimbursed if the customer has agreed an appointment. To this end, it is contacted by our officers by phone. 13,00 Euro per lead.